Bennett's Labor of God, adapted from his dissertation, is a brief and beautifully written argument that Christianity has neutered the gospel of Jesus Christ by domesticating the crucifixion to the point that ideas like sacrifice, blood atonement, penal substitution, and the like, roll off our tongues without even the slightest hesitation. Like Kierkegaard and others before him, Bennett worries that the scandal of the cross and the paradoxical nature of the Christian faith to which it points has been undermined by the death of the metaphors that originally gave it purchase. For Bennett, one way to encourage Christians to once again turn and face the cross is to present them with a new metaphor; i.e., the idea that the agony of the cross is the travail that God undergoes in Jesus Christ in order to give birth to his spiritual children. This metaphor is pregnant because it at once attends to the Johannine language of being "born anew" and the "children of God", and it locates Jesus' suffering not within penal schemes where Jesus' suffering is considered punishment but within a life-giving scheme, where Jesus' suffering brings forth life itself. Furthermore, this way of thinking taps into a rich mystical tradition in the church of thinking about Jesus's suffering specifically as birth pangs. This tradition explicitly includes Anselm of Canterbury, Julian of Norwich, and Marguerite d'Oingt, and is consistent with further maternal imagery found in Origen, Ireneaeus, Chrysostom, Ambrose, Augustine, Bernard of Clairvaux, Peter Lombard, Thomas Aquinas, and Bonaventure. In short, there is a large yet underrepresented tradition within Christian theology of looking at the cross and seeing "Mother Jesus" as Julian of Norwich calls him. The benefits of rethinking the cross in terms of childbirth are manifold. For one thing, it renders the violent nature of crucifixion as an inherently non-violent act of life-giving birth pain. This beats back the imagery of divine child abuse and a violent father that is sometimes leveled at traditional accounts of the atonement. By rendering pain coherent within a generative account of "new birth", Bennett further argues that this will change the way we treat the doctrines of God and creation. 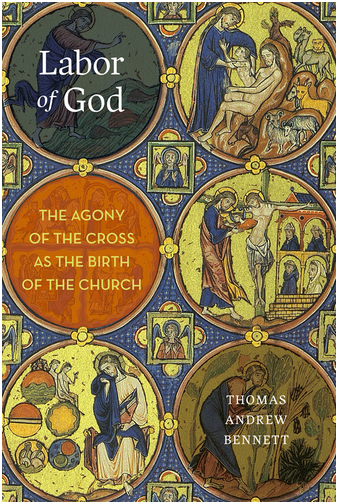 In the case of the former, Bennett argues that the image of an impassible God is simply not tenable in the face of images of travail and childbirth that now represent the the atonement. In the case of the latter, Bennett argues that if new creation is an act that brings forth birth pangs in God, then it is not unfair to imagine that it echos the first creation, the first divine labor. This is further suggested when Eve, who wants to "become like God", now must experience birth pangs herself as a result of eating from the tree of knowledge of good and evil. A second benefit of thinking of atonement as childbirth is ecclesiological. On the cross, God labors to bring forth a new community, a new family of spiritual children. In this new family, God's spiritual children begin to take on the character, traits, and actions that reflect who God, their Father and Mother, is. Third, the cross as labor refocuses the nature of grace itself. Traditional explications of the cross as sacrifice, substitution, and the like, often become "a kind of theological Frankenstein's Monster" where some metaphors and atonement theories are amalgamated with others to tell the whole story in a manner that is no longer rendered coherent (78). Central to many of these ways of rendering the cross is the notion of exchange. Central to the notion of grace is that it is a gift. And yet, the language of exchange places gift language within an economy where gift-giving is almost always implicated in the infinite regress of exchange. I remember who gave me gifts, and I make sure that I reciprocate so that I am not left "owing". On these terms, the cross becomes implicated in the human experience of debt, credit, exchange, etc. And yet, there is one gift we are given that transcends the notion of debt and exchange: the gift of life. Each of us are born into this world by the labor of our mothers; we are launched into life and we simply move forward from there. Spiritual birth is a grace-filled launch into a new life in the family of God. Bennett's is a holistic and attractive vision for thinking through the atonement that renders God consistent from creation to new creation. It is exegetically plausible and rooted in tradition. It is hard to ignore even if it is, at times, a bit over-argued. Bennett argues for a revolution in how we think about the cross so that the church is re-energized with a fresh expression of the gospel leading to a transformed world. This is, perhaps, overly-ambitious. But it cannot hurt to ask the church and its theologians to rethink the cross. That is how all great theological reform begins. Review: A theologian's must-read; a good read for a theologically oriented lay-person; a little too specialized for the theological novice.